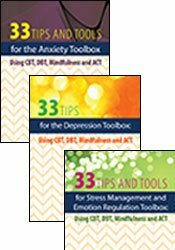 Judy Belmont, MS, LPC, author of bestselling books, Tips and Tools for the Therapeutic Toolbox series will provide techniques to help your depressed clients gain practical life skills that they can use immediately. Implement powerful strategies to treat depression by adapting a variety of techniques from Cognitive Behavioral Therapy, Dialectical Behavior Therapy, Mindfulness and Acceptance and Commitment therapy. Multiple DVD recording (6 hours) with electronic manual and instructions. Integrate “hands on” techniques for dealing with treatment-resistant clients, including activities, visualization, reproducible worksheet and handouts. Describe the essential components of the effective therapeutic session. Identify powerful strategies from CBT, DBT, MBCT and ACT to help your client combat depression. Give examples of how your clients can effectively use behavioral and mood logs, tracking sheets and/or daily or weekly diaries to combat depression. Demonstrate how acronyms, metaphors, thought diaries and mood logs can help client overcome negative thinking related to depression. This intermediate self-study activity consists of 6 clock hours of continuing education instruction. Credit requirements and approvals vary per state board regulations. Please save the course outline, the certificate of completion you receive from the activity and contact your state board or organization to determine specific filing requirements.